Newly Start using replicated data of the past issues is more efficient in the cases such as, report or request with similar information input on a regular basis, or, orders report with the customer attribute information update. By using [Start a new Process with these data] which is indicated on the detail screen of the completed issue of the past, you can register (newly Start) a new issue which data have already been replicated. 1. Use Example of "Reusing Start"
Doing Expense Report (or Leave Request) which is very similar to what has been filed in the past. Removing projects in progress after having replicated data, because errors have been found in the application contents. Retrying with the same data because an error came out in external system connection or email transmission. Reporting the event of a failure, with brushed up Failure Report Statements of the same type failure that has happened in the past. Brushing up the customer notification statement at the time of delivery through practical work. 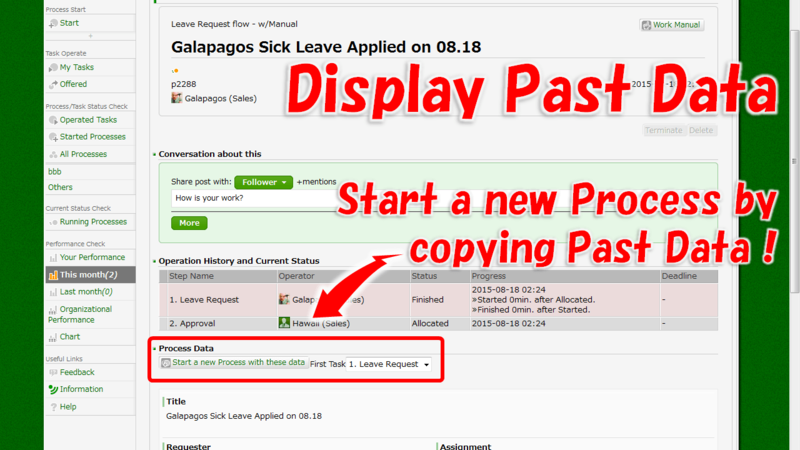 Click on the [Detail] button on the Issue in the Started Issues List or Handled Issues History List. Click on the [Detail] button on the Issue that shown as the search result of in period or keywords. [Data Viewer Authorization] is required to display the List and the [Detail] button. Issues that you didn't undertake eventually will not be displayed even though they have been displayed during [Waiting to be Undertaken]. Click on the [Start a New Process Using These Data] button, to create a new Issue which each data have copied (replicated). If there is more than one Starting point on the workflow, specify the Starting point (the First Task) before copying. Replication range will be different depending on the data viewing level of who replicates. Replication range will be different depending on the input screen (Items that are available). Discussion type data is not the object of copying. Edit the copied data as necessary, and register it as a new Issue. String of "(copy)" will be automatically given to the [title]. 2015-11-30 (Year End Adjustment): Automate Complicated Calculation for "Insurance Premium Deduction" at Year-end Adjustment! 2015-11-24 (Year End Adjustment): Should A Year-end Adjustment Form Include Individual Number? 2015-01-26: Let the Expense Claim Go Online Completely!